Keep Your Aluminium Boat Trailers Fit For Purpose! You are living the dream! You have your boat trailer hooked up to the hitch and you are ready for a great day out on the water. You wouldn’t forget to clean your boat – so don’t overlook your trailer! There are two types of boat trailer owners in the world; the ‘washers’ and the ‘it’ll be right’ guys. Your boat has come out of the water and as soon as you get it home you empty it and start the cleaning process. Lucky for your trailer, you take care of its needs as well. Regardless whether you drive through immaculate river crossings, launch your boat into salt water or explore dirty creeks, washing aluminium boat trailers is essential. There is no one right way to clean boat trailers and everyone has their own tried and tested methods. But for the newbie boat owner, these steps will help you keep your trailer in top condition! Hose off sand and salt. Spray with cleaner (you may have a preferred or suggested cleaner) let it soak for a few minutes and then remove build up, just as you would with your aluminium boat hull. Agitate the build-up with a brush, starting from the bottom and working your way to the top. Rinse thoroughly and repeat if further attention is needed. TIP: Use a toothbrush for those hard to reach spaces. Now that the excess grime has been removed, you can clean the actual trailer surface. Some people just use a soap and water mixture while others use Kleen-A-Hull, acid wash or alternative cleaners for their aluminium boat trailers. Once you have given your trailer a good scrub down, rinse thoroughly. FYI: Many swear by acid wash for a great clean but it can frost the colour of your boat trailer. If you intend on polishing your boat trailer, you should do so in a clockwise direction with a polishing ball and just a few drops of metal polish. If throughout the polishing job you need more, add only as much as is required. With a second clean and dry cloth, buff your trailer. This will give the aluminium a shiny finish. FYI: If you want to maintain a shiny appearance, it will require a lot of elbow grease and eventually the shine will lessen. Aluminium is a metal that fades naturally over time. What if I don’t clean it? It’ll be right, right? Surely missing a few washes won’t hurt, right? Well that really depends on whether you want your boat trailer to be appealing to the eye, fit for purpose and in good condition, or not. Just like your boat, your trailer is both a toy and a tool. Putting time into cleaning might seem as though it’s giving you less time on the water, but if corrosion sets in you’ll be risking both your safety and your enjoyable weekends. If you want functional and great looking aluminium boat trailers, you will routinely clean them. Keep them clean and out of the elements and you’ll be able to spend more time on the water. 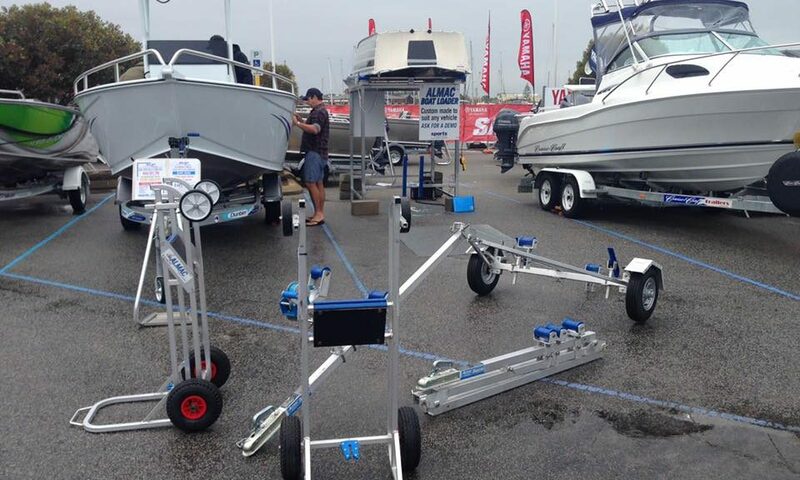 The team at Almac Trailers are the experts in marine grade aluminium boat trailers. If you want the best, you want Almac. Give them a call TODAY on (07) 4152 3737!